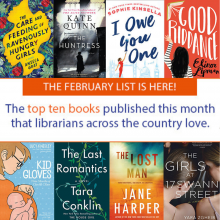 Here are the top ten books published this month that librarians across the country love. Just click on a title or book cover to place it on hold. Categories: Authors & Books, eNewsletter, and Library News. Tags: book recommendations and Library Reads.